Freeport, Grand Bahama Island - One month, two huge events, On October 7th, you won't want to miss Bahamas International recording artist Julien Believe at the Aliv Pink Party at the Canal House, Pelican Bay. Partying from 7pm to 1am along with Daddy Steelie. Tickets are $30 each and are available at Island Yogurt, Print Masters, Gizmos & Gadgets, any committee member or call 533-3384. 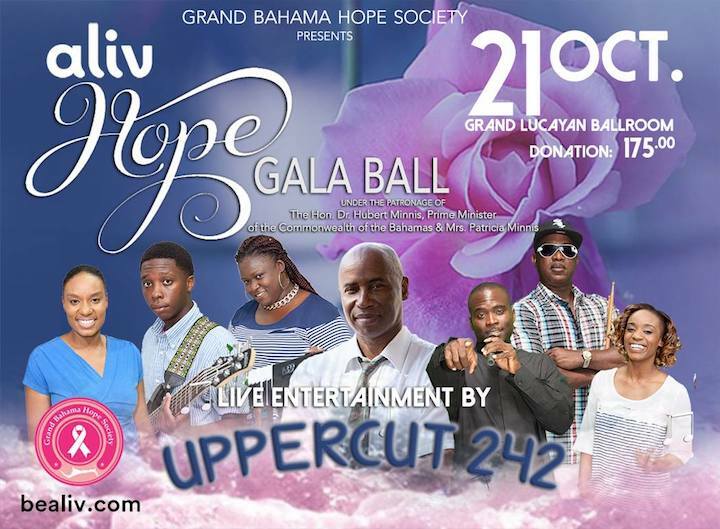 Then, on October 21st, it's the Aliv Hope Gala Ball under the patronage of Prime Minister The Hon Dr. Hubert Minnis and Mrs. Patricia Minnis. The event will be hosted by Karaoke King, Demetrius and features live music by Grand Bahama's favorite multi-genre band, Uppercut 242. This gala takes place at Grand Lucayan. 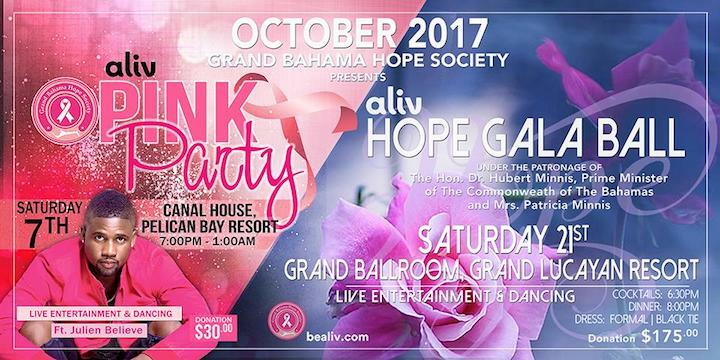 The Aliv Hope Gala Ball promises to be nights full of fun, laughter and passion in support of Cancer Survivors of Grand Bahama Island. Tickets are $175 each and are available at Island Yogurt, Print Masters, Gizmos & Gadgets, any committee member or call 533-3384.